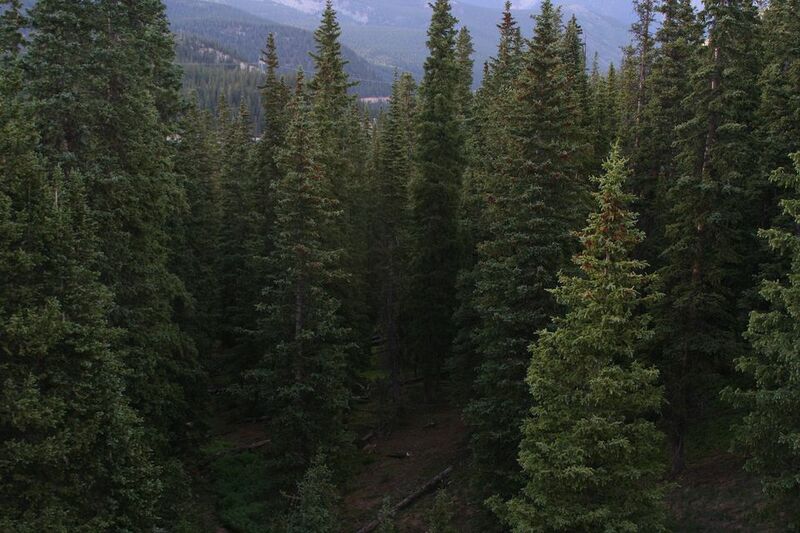 What Is a Coniferous Forest? (adjective) Coniferous describes trees or shrubs that bear cones and have needle-like or scale-like evergreen leaves that are not generally shed seasonally. Instead, these plants retain their foliage throughout the year, even during winter. Examples of coniferous trees include many pine, cedar, fir, cypress, juniper, spruce, larch, redwood, yew, and hemlock varieties. Many of these trees are most prominent in northern areas including boreal forests and cool mountain regions at higher elevations. Coniferous trees are critical for many northern birds because their seed crops are essential food sources. If seed crops are poor, many of these birds become irruptive or nomadic and shift their ranges during winter in search of more abundant foods, shifts that can be dangerous if the birds do not locate suitable resources. Birds that rely on conifers often have specialized adaptations to feed on the seeds, such as extra thick bills to crack seeds or hooked bills that can pry into cones. They are also generally adept climbers or agile to cling to or dangle from cones as they feed, ensuring they can reach every seed. Birds adapted to feed on coniferous trees include the pine grosbeak, evening grosbeak, pine siskin, and different crossbill species, such as the red crossbill. Unfortunately, coniferous trees are just as valuable economically as they are for bird habitats, and many large coniferous forests are harvested for lumber. As habitat is lost or becomes fractured, birds that rely on coniferous trees struggle to survive. This is particularly true for species that require very specialized types of conifers, such as the endangered Kirtland's warbler that relies on jack pine habitat. Birds that require larger, undisturbed tracts of habitat, such as northern raptors, also suffer when these habitats are disrupted. A common misconception and misnomer with coniferous trees is assuming that all evergreens are coniferous, and that only conifers are evergreen trees. In fact, evergreen plants that keep their foliage year-round are not always conifers. Palm trees, hollies, palmettos, magnolias, and rhododendrons are all examples of non-coniferous evergreens. Like conifers, however, these evergreen trees are essential for birds and provide critical habitat. Tropical evergreen rainforests and jungles are the southern counterpart to northern boreal forests filled with conifers. Coniferous trees are an essential part of a bird-friendly landscape. Because these are evergreen trees and stay green throughout the year, they provide necessary winter shelter for year-round backyard species, particularly in areas that receive heavy snow and low temperatures. The best birdscaping will include not only tall coniferous trees, but also lower evergreen varieties such as dwarf tree varieties as well as coniferous shrubs and ground covers. This provides layers of shelter for birds to take advantage of, and mixing different coniferous plants will provide more interesting visual appeal for humans as well as different food sources and shelter types for birds to use. Because many of these trees and shrubs are relatively slow-growing, it can take several years to create a lush, mature landscape with conifers. In the meantime, many birders instantly add temporary coniferous shelter to their backyards by recycling Christmas trees into a brush pile. This can provide extra shelter to birds during the harshest part of winter when they need it most. What Is a Pied Bird?